The iPad is naturally a wonderful visual tool, with its bright, colorful screen. 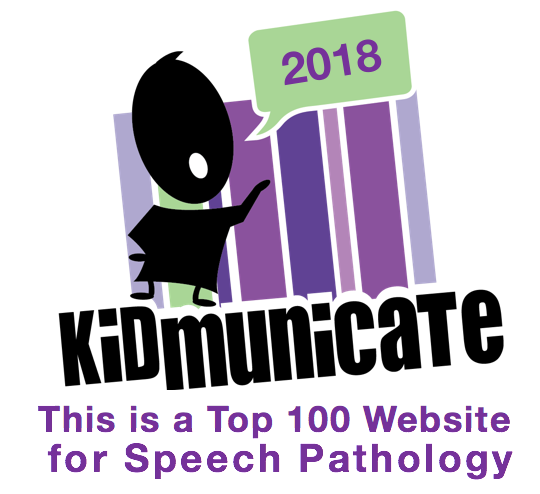 There are so many ways we can leverage its capability to provide clients with visual stimuli to elicit speech and language, but one of the simplest is using Google's Image Search. In the past, SLPs have spent tons of money and/or time to obtain stimuli pictures from commercial publishers or magazines, but now countless images are literally at your fingertips using your iPad. I have written about this topic before, but thought it was worth revisiting for this series. So, in a few brief steps (and an important hidden function), let's look at Google Images on the iPad. 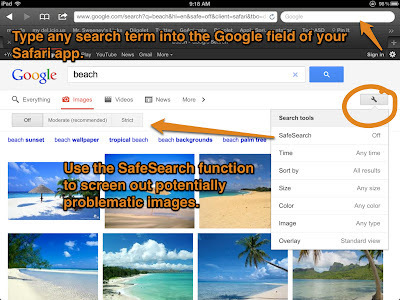 An important "hidden" function of Image Search, SafeSearch, is available by tapping the wrench icon. This reveals a small settings menu you can use to set SafeSearch to Off/Moderate/Strict. 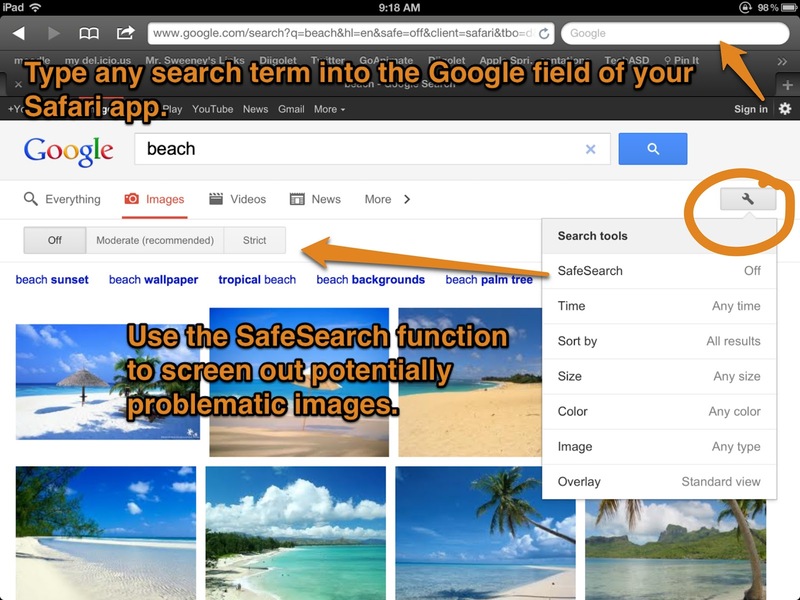 This provides a filter that prevents embarrassing pictures from coming up during search. It is not perfect, but can save you from an unexpected picture of, say, a fireman who would be better suited (no pun intended) for a bachelorette party than exploration of the category of community helpers. Note that the wrench menu also allows you to look for more recent images (under Time), find more high-resolution/larger photos (under Size), and look for a particular type of Image (Face-helpful for teaching feelings/expressions, Photo, Clip art, or Line Drawing). Tapping on any image in the array will bring up a "Cover Flow" view. This allows you not only to sweep through larger views of each picture in the search results, giving a better visual to describe/compare and contrast images with your clients, but also a means to save the image to the iPad. The saving step can be a bit tricky. You have to tap solidly on the central image and not move your finger side to side, which of course brings you to the next image. It takes a few tries to get it right! 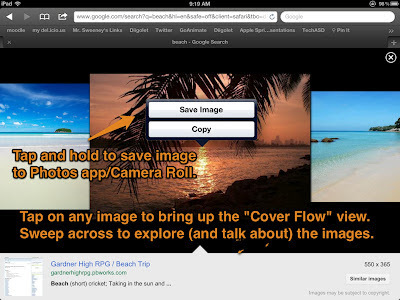 Here's a nice tutorial from Scott Ligon if you would like to see the gesture used for saving (note that Google works a bit differently now and the "tap full size image step" shown in the video has been replaced by the cover flow look as seen above. Being able to save images opens so many possibilities and contexts in the use of your iPad as a creation tool. The amount of apps that allow you to create something using photos from your camera roll grows every day, but includes digital storytelling apps such as Puppet Pals and Photobabble, comic creation apps such as Strip Designer, and book creators like Scribble Press and My Story. What can you do with Google Images, looking through a Language Lens? -Find examples aligning with classroom vocabulary, either tier 2 words (e.g. intense) or content words (e.g. plateau), especially as you discover gaps in student understanding that would benefit from a quick visual. -Use for category building, teaching features, description, similarities and differences. -Easily locate images to go along with articulation word lists. -Using a program such as Visualizing and Verbalizing? Look up an action word (e.g. swimming) and instantly you have a lesson for the Picture by Picture level. Such images can also serve as great story starters. What other ways have you used images in therapy? Let us know in the comments! Thank you for this blog post ! I wanted to write something similar in my blog (in french) but you were quicker than me. Do you mind if I write the blog post anyway (as long as I mention your blog) ? I use the "Image Search" app all the time to access pics for anything from reading vocabulary to photos to include in social stories and to add to ACC apps. I like the image search app because it saves a few taps but you can also just save Google Images to your home page so you don't have to open Safari for access each time. Giving kids a variety of thumbnails to look at for a given word allows them to create "boundaries" for word meaning rather then a single picture representation. This is an invaluable teaching resource IMO.